LIBeerGuide hopes you are enjoying the holiday season and that you've been able to attend some of the fun celebrations across Long Island. 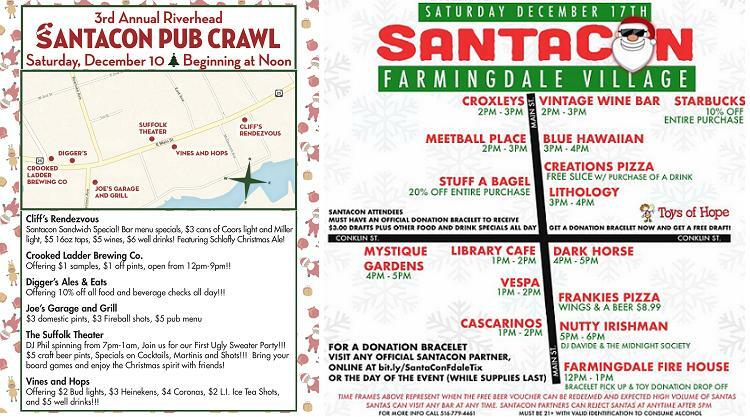 Two of the most festive events are happening over the next two weekends: on December 10 is Riverhead's 3rd Annual SantaCon Pub Crawl and on December 17 is Farmingdale Village's SantaCon 2016. Both SantaCon events are raising money for charities, Riverhead's for RSVP Animal and Rescue Group and Farmingdale's for Toys of Hope. Participants will enjoy beer specials at participating pubs and breweries including Crooked Ladder Brewing in Riverhead and Lithology Brewing in Farmingdale. So get your Santa on and join the fun! New breweries and tasting rooms -- LI now has 43 craft breweries, which is remarkable considering that 10 years ago there were just 5 -- one brewery and 4 brewpubs. We also have 24 brewery tasting rooms and brewpubs following the opening in 2016 of 3 new tasting rooms (Lithology in Farmingdale, Garvies Point in Glen Cove, 1940s Brewing in Holbrook). More tasting rooms are on the way, with Brewers Collective in Bay Shore hoping to open before year-end and at least 3 other breweries aiming for early 2017. LI beer lovers now have 10 towns that are beer destinations, where you can visit a brewery or brewpub, enjoy locally-brewed beers at a beer bar and dine at a gastropub, all in one day or just half a day. Check out our list of Long Island Beer Hubs and make some plans for 2017. Increased local craft beer distribution - Many of LI's craft breweries have been selling their beer in cans for years, including Blue Point and Montauk Brewing, who use contract brewers located off the Island. More recently, breweries including Port Jeff Brewing and Oyster Bay Brewing began taking advantage of new, less expensive canning equipment to do canning at their breweries. 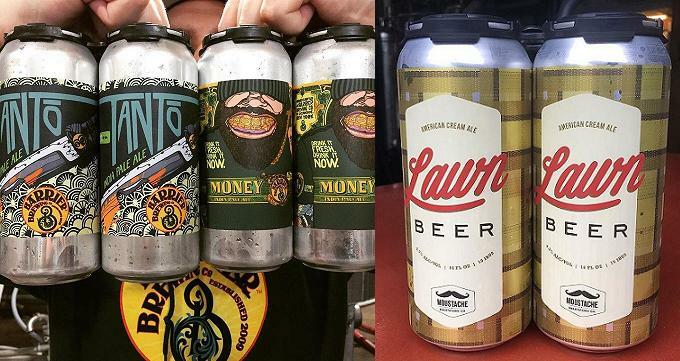 The trend accelerated in 2016 with several other breweries, including Barrier Brewing, Destination Unknown and Moustache Brewing, joining the canning club. LI beer lovers can look forward to finding more cans of their favorite craft beers on retail shelves in 2017. Check out our list of Long Island Beer Retailers. More beer festivals and events - there was no shortage of events across LI in 2016 to taste great beer. Long Island Craft Beer Week 2016 was held in May with dozens of beer dinners and tasting events. The week was highlighted by the introduction of Craft Cares IPA, a collaborative beer from the brewmasters of 11 LI craft breweries, an effort that successfully raised canned food donations for Long Island Cares food bank. After 9 years on the North Fork, LI's largest summer beer festival moved to a new location, Heckscher State Park, with a new name, Long Island Craft Classic. The festival's organizers, Starfish Junction, also held popular spring and fall festivals at Belmont Park. Blue Point Brewing in Patchogue held its 12th annual Cask Ales Fest in the spring and added a new Logger Lager Festival in the fall. Another successful new festival this fall was the Nautical Mile Brew Fest held in Freeport. For a list of upcoming festivals and other events across Long Island check out our Events page. 2016 was a fun year for LIBeerGuide and we are gratified by the support we've received since launching our new website in April. 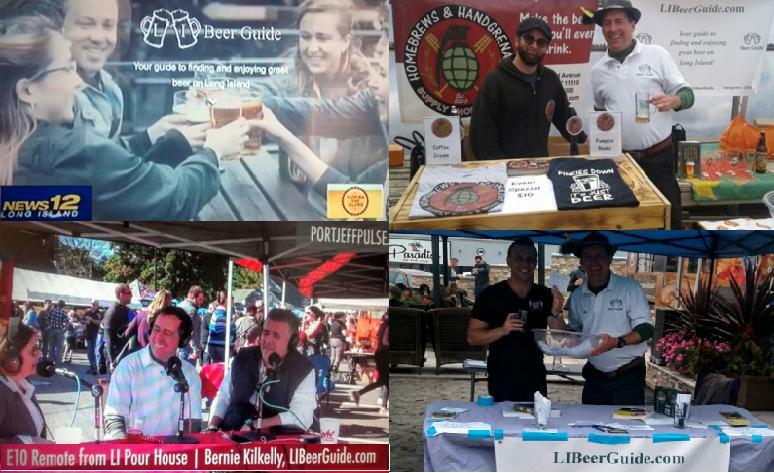 Among the highlights of the year for us were being featured by News12 Long Island in a piece on the growth of LI craft brewing and our participation in several beer festivals, including an interview with the Port Jeff Pulse. We look forward to even more fun in 2017! Welcome to first time readers of the LIBeerGuide Brewsletter. All new subscribers in the month of November were entered into a raffle for a beer prize and the raffle winner is Norman Ryder. Norman won a book that is featured on the Books page of our website: "The Foodie's Beer Book," an excellent primer on pairing food and cooking with beer. Congratulations Norman and please spread the word about our Brewsletter, we will hold another raffle for new subscribers in December. There are many ways to reward the beer lovers on your Christmas list who've been nice this year. Brew Crew Cycles in Riverhead has a variety of gift packages that are available with free shipping until December 14. 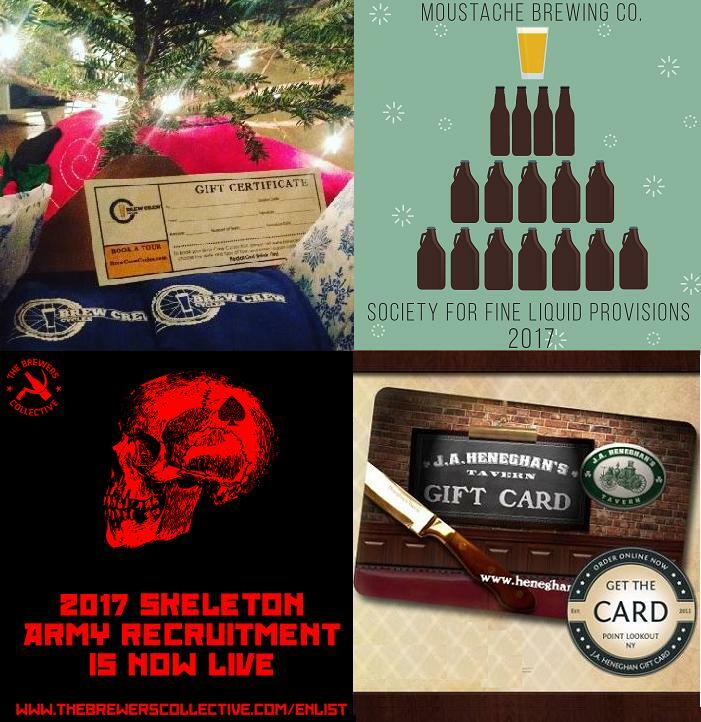 Several LI breweries, including Brewers Collective and Moustache Brewing, are offering unique Club Memberships with perks that include discounted growler and pint fills, And of course, many beer bars and gastropubs such as Heneghan's Tavern offer gift cards. -- The Pig & Queen is a new barbecue restaurant in Rockville Centre opened by the folks who own The Good Life. At The Pig & Queen, mouth-watering Texas-style BBQ and other Southern dishes pair well with 12 draught beers including Barrier and Barrage. -- Brew and Beyond recently opened in Calverton selling homebrew supplies. -- Anthony's Coal Fired Pizza opened its seventh Long Island location in Farmingdale and BurgerFi opened its fourth LI location in Commack -- both chains have good craft beer selections. Feb. 11 -- Hops and Props Craft Beer Festival at the Cradle of Aviation Museum in Garden City. VIP session from 6-7 pm, regular session from 7-10 pm. Feb. 25 -- T.J. Finley's Winter Bourbon Festival at T.J. Finley's in Bay Shore. VIP session from 3-4 pm, regular session from 4-7 pm. Please like LIBeerGuide’s page on Facebook and follow us on Instagram and Twitter. We look forward to connecting with you! Copyright © 2016 LIBeerGuide, All rights reserved.